Biographies of the Wombles in the 1998-1999 ITV television series, courtesy of The Official Wombles Website. 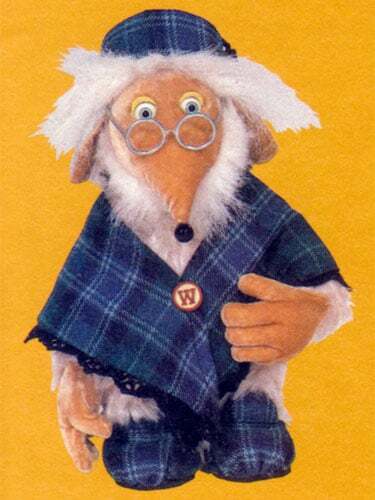 Great Uncle Bulgaria is the head of the Wimbledon burrow. 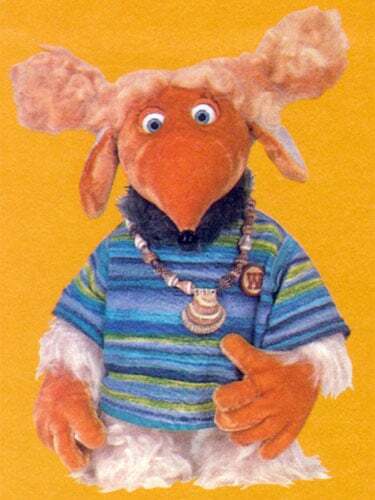 His full name is Bulgaria Coburg Womble, but he is known as Great Uncle Bulgaria to the young Wombles. He is very old indeed, no one really knows exactly for sure, but it’s safe to guess he’s anywhere between three hundred years and eternity. His age and status have brought about some eccentricities. Great Uncle Bulgaria’s one weakness is his daily copy of The Times, from which he gets information about the human world and which he’s often heard to insist “never lies”. He has a particular obsession for the crossword. Great Uncle Bulgaria often rejects modern technology, not because he doesn’t see its potential, but because he understands the value in tradition. (“Computers? Pshaw! A quill and paper is all anyone really needs to write with…”). To Great Uncle Bulgaria, the new technology is to be viewed with suspicion. He supports Tobermory’s grand unconventional inventions, but remains firmly grounded in doing things the way he’s always done them. You would never see him going for a ride in the womcopter (although he’s been known to take an unintentional spin in the buggy!) or sending a message on the womfax. He is still fazed by the wellicom and the speaking tube system in the burrow. A master storyteller, he has an anecdote for any occasion, a fantastic tale for every situation, and words of wisdom for anyone within earshot. 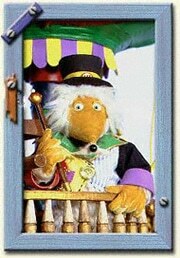 Venerated for his wisdom and experience, Great Uncle Bulgaria indulgently supervises the younger Wombles, who think he knows everything. He can be gruff and strict, but he has a kind heart. Tobermory is second-in-command of the burrow, helping Great Uncle Bulgaria by overseeing its day to day workings. He also serves as a mechanical mastermind and has a particular gift for making useful gadgets out of ordinary, everyday rubbish. He doesn’t believe in waste and can see a use for everything. Tobermory is very good friends with Great Uncle Bulgaria. 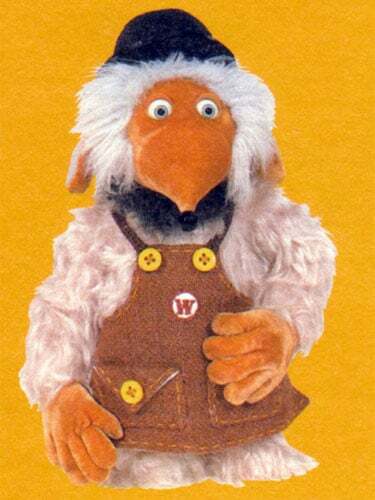 While he has fully embraced the 21st century, he fully respects Great Uncle Bulgaria’s views on the origin of things and has great respect for the old Womble’s position. While Tobermory is very comfortable motoring around in a turbo wom-hummer, he can also be seen strolling by alongside Uncle Bulgaria on their morning walks. 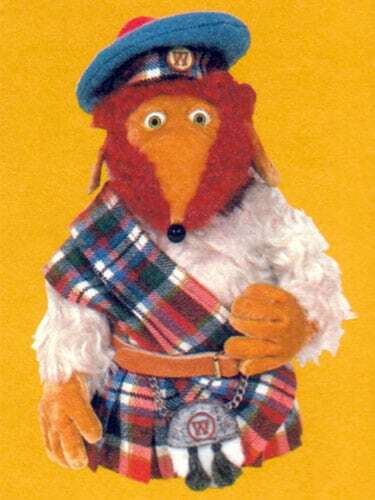 Tobermory is middle-aged (about halfway between Uncle Bulgaria and the younger Wombles), phlegmatic and practical. While he stands no nonsense from the young Wombles as he supervises their daily clearing-up duties, Tobermory is patient and steadfastly positive. 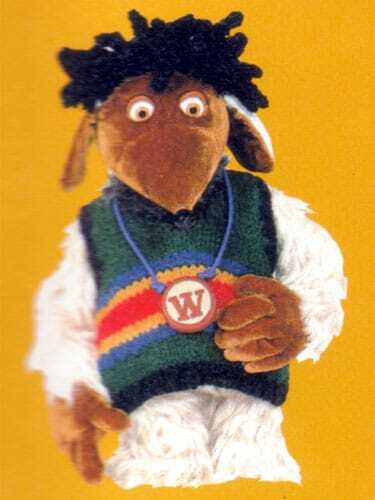 He is also confidant to the young Wombles and a strong supporter of most any endeavour the young Wombles embark upon. Tobermory has a chivalrous, gentlemanly relationship with Madame Cholet, treating her as his well-respected equal. He is very fond of Wellington’s attempts at inventing, and likes to encourage his young apprentice whenever possible, but at the same time very often ends up having quite a mess to tend to when Wellington’s inventions go horribly wrong. Madame Cholet is the burrow’s cook, and an auntie figure to the young Wombles. She is closest to Tobermory in age, and rather more straight-laced than Great Uncle Bulgaria or Tobermory. Lively and spirited, she talks a mile a minute and her conversation is punctuated by words and phrases in French. 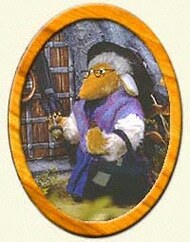 A respected member of the Womble family, Madame Cholet is third-in-charge. Whenever Great Uncle Bulgaria has to leave the burrow, he makes her his deputy. As Orinoco sees it, you may as well do what you’re good at, and he knows he’s good at eating and sleeping – both pastimes get a lot of practice. 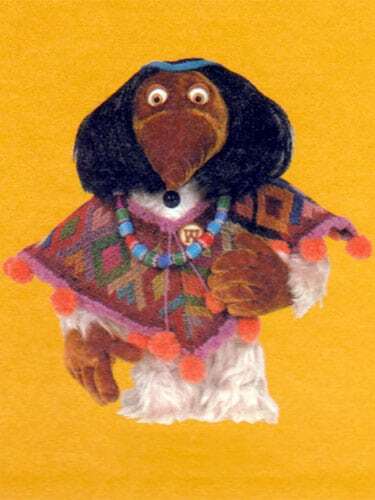 Rather chubby, somewhat lazy and sometimes greedy, Orinoco is still the most loveable of all the young Wombles because his motives are so very basic. He has a great air of innocence which prevents his habits from being annoying to others. Orinoco is actually rather clever, which is how he manages to succeed so often in avoiding work and finding a hiding place for a quick forty winks. When necessity strikes, he can be very imaginative. And, truth be known, it is possible to distract Orinoco from his two obsessions as he does enjoy an adventure, but it isn’t long before his attention returns to you know what. Orinoco doesn’t get around as quickly as the others and, being out of shape, he is prone to the occasional injury. Orinoco has a very calm nature and isn’t one to overreact needlessly. He sometimes tends to miss the enormity of a situation. The others tend to watch out for him and are always around to offer him a helping paw, or a boost over a low fence. There was a time when Bungo and Orinoco didn’t exactly get along, although now they are good friends. Bungo will sometimes succumb to a practical joke at Orinoco’s expense, but it’s generally good-natured. When Wombles come of age, they carefully choose their names from the old atlas in Uncle Bulgaria’s study. All it took Bungo was the few seconds needed to shut his eyes and point. Bungo can be quite competitive and is never too shy to proclaim any victory, even in the smallest of competitions or games. He also always tries to be first to find a copy of The Times for Great Uncle Bulgaria. Though the second youngest in the burrow, just after Shansi, Bungo has probably had the largest number of adventures of many of the Wombles. Bungo has a great sense of humour and of mischief. He is fond of pranks and can often see the lighter side of a situation, sometimes to the annoyance of the rest of the burrow. He is particularly fond of trying to unsettle Orinoco. He has a unique relationship with Tomsk, whose innocence often means he gets taken in by Bungo’s plans and pranks. Bungo relies on Tomsk’s physical abilities to help him in his plans. 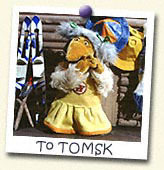 Tomsk is the largest of the Wimbledon Wombles. He is strong, athletic and sporty – a very physical character. All Wombles love nature, but Tomsk has a particular affinity for the outdoors. Tomsk’s exceptional size and strength are belied by a very gentle soul and childlike innocence. 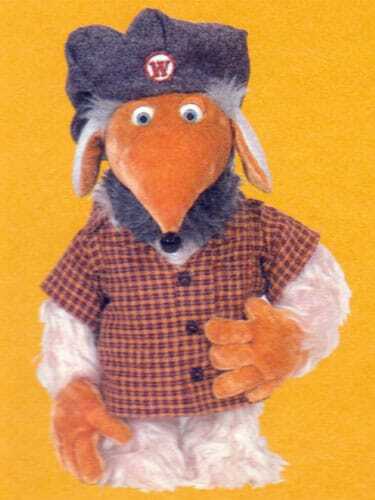 He is a warm, loyal, loveable Womble, who – how shall we put it? – lacks any real mental prowess. He is prone to taking things literally, which has rather drastic results at times. Tomsk quite often gets taken in by Bungo’s mischief and they are a bit of a double act. He doesn’t always understand what Bungo’s up to, but laughs along anyway so as not to be left out. Tomsk is a devoted friend, dependable and good-natured. His job is very often to serve as night-watch Womble, making sure that all of the Wombles have returned safely each evening. The complete opposite to Tomsk, Wellington lacks physical stature but he is the brightest of them all and a very keen inventor in training. Having spent so much time in his books and at his inventions, he hasn’t fully developed his interpersonal skills and is sadly lacking in social confidence. He comes across as very shy, but when the conversation turns to ‘shop’ Wellington becomes really talkative. (Asking him the time, for instance, would result in a very detailed account of how a clock or watch is made!) When talking technical, Wellington is prone to using seven words when one will do and littering his speech with pseudo-scientific language. Tobermory appreciates Wellington’s interest in inventing and has taken him under his wing to try to teach him all he knows. He also tries to encourage Wellington that it’s also important sometimes to stop working and have fun. Because Wellington can get so focused on what he’s doing, he has a tendency to be rather absent-minded. The other Wombles tease him about this. It isn’t uncommon for him to forget an important message, his birthday, or the key safety features he was supposed to include on his latest contraption. Alderney is a distant relative of Great Uncle Bulgaria. She is a lively, adventurous young Womble with a profound sense of curiosity of the world around her; she loves nothing more than to find and try to do new things. Alderney is strong-willed and doesn’t take no for an answer. She is an agent for change and she tends to challenge the old Womble way of doing things. Because her head is filled with so many ideas, she frequently goes off in tangents, sometimes in mid- conversation, sometimes while she is in the midst of doing something else. As a result of the many experiences she’s had, Alderney tends to have a unique way of doing things and dares to be different. The best example of this is the fact that Alderney lives in a treehouse on the Common – Wombles are typically burrow-dwelling creatures. Alderney’s particular concern is water pollution. She chose the spot for her treehouse because of its proximity to Queen’s Mere. She likes to be able to keep an eye on things there. Alderney takes great pride in her efforts in the kitchen, but as far as the others are concerned she has got a lot to learn! She is a bit of a health food nut and will concoct odd recipes which never tend to go over very well. Madame Cholet tries to advance Alderney’s culinary abilities, but it’s usually impossible to keep her attention long, before she’s off in another direction. Alderney and Wellington are frequently found paired together, which is interesting since they couldn’t be more opposite: Alderney is affable and outgoing, Wellington is shy and lacks social confidence; Alderney is generally off in a million directions at once, Wellington is obsessive and very focused. But their differences could be what appeals to them. Alderney is a very good womcopter pilot! Shansi is the youngest inhabitant of the Wimbledon burrow. She is a tiny Womble of Chinese descent. Soft-spoken and sometimes shy, Shansi possesses great strength of character and a directness often only found in the young. Not yet comprehending the notion of discretion, she says what’s on her mind – and frequently what’s on everyone else’s mind. For instance, when Cairngorm last came to visit, there was a gasp of shock when Shansi came right out and told Cairngorm his bagpipe playing was giving everyone a headache. This directness has given her a sense of wisdom beyond her years, and she is frequently being asked her advice on various topics. Shansi is neat, precise and something of a perfectionist. She excels at the artistic, and her penmanship is so accomplished that Great Uncle Bulgaria and Tobermory often call on her to draft their important letters. She is an expert gardener. She collects rare and fragile seedlings and plants from the Common and nurtures them in her secret garden, which is underneath an earthy, south-facing bank, utilising the partial shade of an old weeping willow tree. When her weak plants are strong and healthy she replants them on the Common. She also grows exotic nuts, berries and herbs that help to keep Madame Cholet’s kitchen well-stocked. Stepney is a frequent visitor from the Thames burrow. 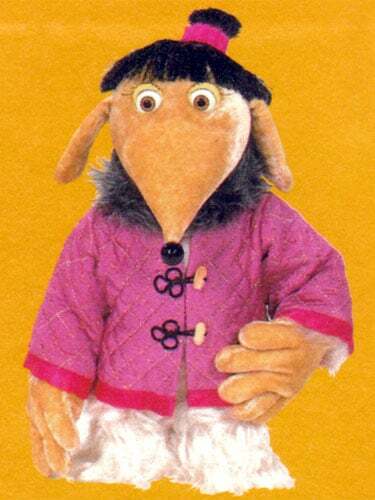 He is like your typical East End barrow boy and is much more ‘street wise’ than the Wimbledon Wombles, who he has become good friends with and who he visits quite a lot. Stepney truly loves rubbish and is frequently seen admiring his finds and admiring the other Wombles’ finds, and can be heard bartering and trading from the back of his barrow. His idea of the Wimbledon motto “making good use of bad rubbish” is to sell it off the back of his barrow for a better grade of rubbish. Stepney is seldom seen without his ‘barrow’ which is always full of his latest finds. He is also very fond of music and is constantly finding old LPs and singles to play on the womblified gramophone that Wellington adapted for him. An interesting fact about Stepney is that, although he comes from the Thames burrow, he has a very strong dislike of bodies of water and can’t swim. Any suggestions for outings on the lake are usually met with his disapproval. Bombastic, full of himself and possessing awfully bad skills on the bagpipes, MacWomble is a force to be reckoned with. He is an occasional visitor from the Loch Ness burrow. When he does come to visit he complains constantly as it seems he is at his happiest when most miserable. He misses decent clover tea and always has something to complain to Madame Cholet about (even though he secretly loves her cooking and wouldn’t mind her living with him in Scotland). 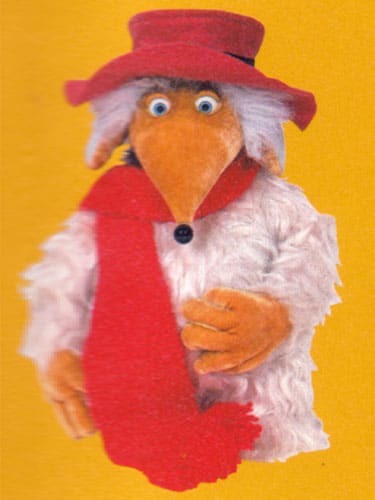 Little do the Wimbledon Wombles know how much MacWomble really envies them. As much as he seems to frown upon the ways of Wimbledon Wombles, MacWomble is prone to making a fair amount of surprise visits. And when MacWomble comes a-calling, his bagpipes always travel with him. MacWomble’s burrow is situated within a cliff on the side of Loch Ness. The exterior of the burrow has been made to look like a castle over the years. MacWomble has big problems keeping the huge underground chambers tidy. Because of his travelling experience and his keen interest, Obidos knows a little bit about practically every subject. Possibly as a result of his travels, and because he’s absorbed so many of the different customs he’s witnessed, Obidos has adopted some rather unique habits, for instance, playing the panpipes. The other Wombles find him most interesting, but extremely odd at times. 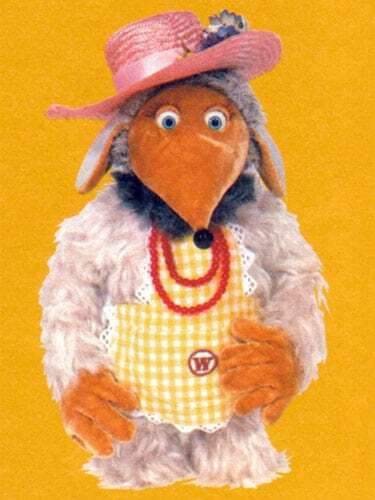 Nanny Alexandria was Great Uncle Bulgaria’s nanny when he himself was a young Womble. Now, if Great Uncle Bulgaria is old, she must be… well, no one really knows how old she is! She has weathered well and still manages to keep her blue pinafore dress and apron starched and clean (despite a few patches here and there). She wears a black, battered old felt hat and nowadays wears a shawl to keep the cold from her neck. Despite all this, she is still able to keep any mischievous young Womble in their place, even though she sometimes forgets their names and calls them by whatever name comes into her head! Instead of a place, Livingstone is named after the British explorer, Dr Livingstone. Not even Livingstone remembers the name he originally chose! Again Livingstone is an older Womble. Great Uncle Bulgaria did a lot of travelling with him in his youth. One of the episodes tells a story about an adventure they had together. Livingstone travels around in a huge hot air balloon galleon type ship. 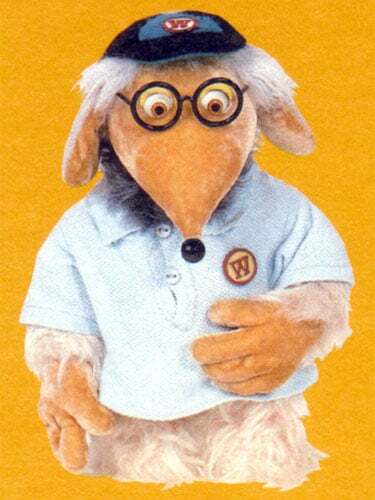 He travels through the skies helping Wombles and discovering new Womble burrows in some of the more remote parts of the world. 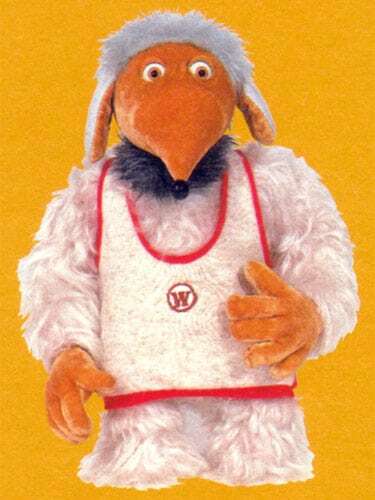 Moosonee is a Canadian Womble who Tomsk writes to as a penpal. She lives in a remote part of the Canadian Rocky Mountains. In this area of Canada, Wombles don’t live in burrows. They tend to live in individual log cabins in large areas of forest that gives them plenty of cover from human eyes. They pick up a lot of litter from the skiers and adventurers who visit the area. 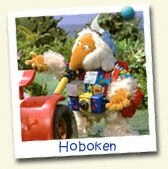 Hoboken is a distant second cousin of Great Uncle Bulgaria and lives in the United States of America in the same burrow as Bulgaria’s Cousin Yellowstone. Hoboken is a complete tourist. He loves visiting all the burrows in the world and generally makes a nuisance of himself as he does so. He is always happy to visit our Wimbledon friends and loves the laid-back but hard-working nature of all the Wombles there. Hoboken always has his camera handy for recording his trips and loves to give out advice to other Wombles about how they should be doing things. He is full of ideas for new time-saving inventions for Tobermory and Wellington to try to create. Hoboken is very difficult to miss as he always wears his trademark loud shirt and backwards baseball cap. in 2002 when the club was formed. Thanks Malcolm! In fact Haydon has his own page (along with Wandle the Womble), as well as a few news articles about things that Haydon’s done. And no bio on Cousin Yellowstone ? Uncle Bulgaria is the leader of the wombles and is very smart . That’s how he teaches the wombles , he is over 3 hundred years old and I think he is grooved and great!